Fish pie has never really been a thing I yearn for. Well, fish and seafood in general aren't the first thing I think of when I crave my favorite foods. 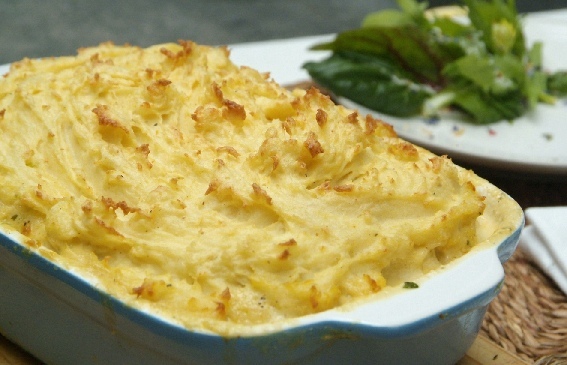 But, my personal yearnings aside, fish pie is a dish which seems to be such a firm family favorite in most homes with any Anglo Saxon origins, that it is a dish I need to know how to make. 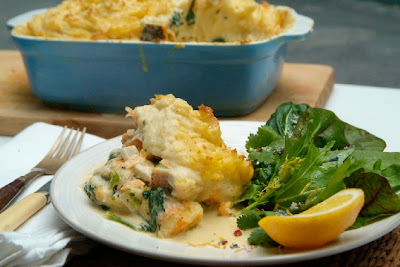 I did write a post a few months back on a fish pie, but that was a low fat and low GI version. I recall it being a really good one too, but today after reading a blog about traditional fish pie I decided I needed to make the real thing. I had some frozen haddock in the freezer and most of the other ingredients in the fridge, so I set to work. The cooking process was remarkably quick and the results extremely satisfying on the cold and raining day we had today. As for the richness of the meal, it made it all the more filling, so I ate less and had added a salad as a side dish. Very happy with this meal. Start your potatoes simmering in a medium pot of water. While the potatoes are boiling, heat the butter and oil in a large pan. Add the onion, garlic, carrots and celery and fry gently for about five minutes until the onions turn translucent. Add the cream, seasoning and spinach and allow them to simmer until the spinach starts to wilt. Add the haddock, stir to combine and turn off the heat, allowing the fish to be cooked further by the heat in the pan. Pre heat your oven to 220C˚ and place the rack in the middle of the oven. Once the potatoes are cooked through, drain them, add the butter and mash them until smooth. Add the salt, mustard and parmesan, as well as a ½ cup of the cream sauce from the fish mixture and stir to combine. 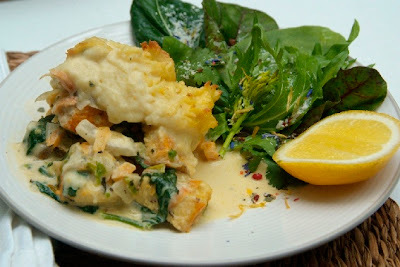 In a medium casserole dish spoon the fish mixture and using a fork, top with the mashed potato. Bake this in the oven for about 20 minutes or until it has started to brown on top. I also place a baking sheet under the dish as the mixture can bubble up and run over the edges some times.